Welcome fellow agents of Precinct1313 to another episode of Comic Cover Of The Week, and an extra special welcome to our continuing “Women’s History Month Spectacular” a bombastic blogging event set up by the tantalisingly talented Cupcakes and Machetes. Supergirl’s more recent adventures since her DC Rebirth renewal have been rather awe inspiring, as the creative teams have foregone a lot of what constitutes the typical cape and cowl comic book hero tropes, and have been focusing their efforts on Kara’s trials and tribulations as a teenager and alien visitor. The stories have been much more intimate and slow burn than out and out action and conflict, and with the Girl of Steel finding herself back in mainstream public consciousness thanks mainly to the amazing CW television series, Superman’s Kryptonian cousin is soaring higher than she ever has. Diversity has been at the forefront of Kara’s comic book adventures, with DC Comics evolving along with the world around them to spotlight and champion characters from across a much broader spectrum of gender, race, and ethnic heterogeneity. In fact Supergirl #19 steers itself away from the principal narrative of Kara Zor-El and focuses its attention on Lee Serrano, a brand new non-binary character who is struggling with their emerging identity crisis, bullying from their student peers, and an increasing anxiety about revealing their gender quandary to their parents, this topical storyline is deftly handled by writer Steve Orlando with an extremely sensitive and compassionate take. Lee is initially presented as androgynous up until the point of their coming out in two sequences, once with Supergirl and secondly to Lee’s parents. It’s an emotional and fantastically wrought piece by the book’s creators and is a heartfelt tale that sits perfectly with what we have come to expect from the ongoing Supergirl monthly comic series. Don’t get me wrong, I really do like the Teen Titans, but I just don’t have enough money, time, or space to buy everything, so certain monthlies I have to begrudgingly let go, and Titans is one of those… yet, I love the character of Starfire so much, that I am predisposed to buy literally everything that she’s involved in. Luckily this specific Titans issue is a standalone title, a one shot story, meaning there is no need to read the previous fifteen issues to understand what in X’Hal is going on… so, phew! An unseen villain has taken over the citizens of San Francisco with one target in mind… Starfire! Can Kori and her teammates figure out a cure for the masses before they lose control of their minds and bodies forever? Find out in this one shot epic by the mythical Marv Wolfman! Starfire, Teen Titans and all images are copyright: DC Comics. Welcome, my comic collecting cohorts, to another episode of Comic Cover Of The Week, and once again we bask in the illuminating magnificence of Jenny Frison’s incredible artistic talent. DC Comics’ Wonder Woman Rebirth series has been a revelation since its 2016 relaunch, the twice monthly title has been one of the most beautifully crafted and emotionally absorbing runs in Diana’s long and varied history. Enhancing Greg Rucka’s initial story arc were the vivacious visuals courtesy of Liam Sharp and Nicola Scott, with each and every panel a masterpiece in its own right. Rucka’s epic “Truth and Lies” saga came to a close in issue #25 after its award winning run, with the initial team of superstar creators leaving the book to move onto other projects for DC. And though the sacred duties for guiding our favourite Amazon warrior Princess have now fallen into the capable hands of Shea Fontana and Mirka Andolfo, one of the original artistic architects is still onboard with the title, the fantastic Jenny Frison. Jenny has been the variant cover artist for Wondy’s rebirth since issue #7, taking over duties from Frank Cho who sensationally quit after apparent ‘artistic differences’ with series writer Greg Rucka. Frison’s variant covers have been breathtaking, beautifully rendered paragons of artistic endeavour and this month’s issue is yet another paradigm of grandeur, and quite possibly my favourite piece from the talented artist yet. Wonder Woman #27 continues the “Heart Of The Amazon” tale and finds someone close to Diana being the architect behind the recent attacks on her and her friends… but what has this person learned about her powers that she never even knew herself? Wonder Woman Rebirth #27 is available at your local comic-book emporium right now. The Bat, The Cat… And Wedding Bells! Where exactly do Superheroes get married anyway?… mmmmmm, I’m getting ahead of myself here. Welcome my comic collecting cohorts to another instalment of Comic Cover Of The Week, and this week our splendiferous spotlight of excellence falls upon Batman Rebirth #24. This illustriously illustrated issue is brought to you by those ceaseless composers of comic-book craft – Tom King, Danny Miki and David Finch. Batman #24 is an emotionally charged issue from beginning through to emotive end, the Bat, the Cat and wedding bells? it’s certainly a possibility as Gotham’s grim guardian sensationally gets down on one knee to propose to the feisty feline felon known as Catwoman. So will this mean a happy denouement to the trials and tribulations of the dark and scary one’s overtly complicated and melancholic life? Maybe, but I wouldn’t hold your breath, this is the Batman we’re talking about here, when has his life ever involved anything more than tragedy and vicissitude. Batman #24 is available at your local comic book emporium right now. The original Dark Knight Returns saga by Frank Miller was a defining moment for The Batman, Miller’s alternate take on the much loved Superhero cast the character in an even more extreme grim, gritty and violent setting, with the caped crusader himself a dour and sullen character whose inner demons continually haunt him as the weight of age and a life of brutal violence takes its toll. We follow an ageing Bruce Wayne as he struggles with these psychological demons, and attempts to hold back his rage and inefficacy through alcohol addiction and suicidal abandon of his life through varying extreme motor sports. Miller’s classic 80’s series, alongside classics – Watchmen and V For Vendetta, shook up an atrophying comic book industry and presented a much more adult and psychologically emotional depth to Superhero comics, defining the future of the industry in a monumental way. Miller returned to his raison d’etre in the 2001 follow up mini series The Dark Knight Strikes Again, yet, unlike its groundbreaking predecessor, this was not favourably received by fans or critics alike (myself included) the book was little more than a parody of previous events, and Miller’s artwork had taken a severe downturn in quality. Jump forward 14 years and Dark Knight III: The Master Race debuted, the newest chapter in the alternative Batverse, and it’s been… mostly OK, I guess, unfortunately the original series was such a phenomenon that any subsequent take has fared rather badly, unable to match the originals magnificence. That said, there have been some defining moments (mainly visual) in this ongoing series that have certainly taken the breath away from this particular Batfan, and the gorgeous Bill Sienkiewicz variant cover is one of those marvellous moments. It evokes so beautifully a man haunted by his past, a broken figure who has ultimately accepted his failing to protect the city and people he loves, yet will fight on even though it will probably mean his own demise… this image, to me, defines The Batman irrevocably, and contains more emotional substance than both the second and third chapters of the Dark Knight trilogy put together. Welcome my comic collecting cohorts to another instalment of Comic Cover of The Week, and this week’s illustriously illustrated issue is brought to you by, superlative scribe Scott Lobdell, and kingly Kenneth Rocafort. The Red Hood and the Outlaws Rebirth series has, thus far, been fantastic, Lobdell’s intense interactions between the offbeat triumvirate of Red Hood, Artemis and Bizarro are definitely the highlight of the series. Lobdell’s cracking characterisations are equally matched by Rocafort’s amazing artwork. We have been huge fans of Mr Rocafort’s peerless mastery of pen and pencil since we first discovered his work on the original 2011 Red Hood and the Outlaws series, it’s the little details he puts into each and every panel, in fact the art is so busy and complex, we do have to wonder how in Tartarus does he get the time to illustrate a complete issue, each… and every… month, the man is a machine! This issue kicks off the “Who Is Artemis” storyline, as we catch up with our favourite band of justice seeking miscreants in a Gotham City bar, on the trail of ominous Bat-Villain, Cornelius Stirk. The majority of the comic takes place within said bar, and revolves around a conversation between Jason (Red Hood) and Artemis, as she regales her crime fighting colleague with her rather colourful history in Amazon lore. The synergy between Jason and Artemis is ably captured by Lobdell this issue, especially Jason’s idiosyncratic personality. The quirky banter between our two leads makes for an exceptionally fun read as we explore Artemis background, and the reasons behind her (ongoing) search for the legendary Bow of Ra. And just when you think the issue couldn’t possibly get any better, we get a guest appearance from Artemis’ Amazon sister, Wonder Woman! Red Hood and the Outlaws #8 is available at your local comic-book emporium right now. Welcome my comic collecting cohorts to new comics Wednesday, and with it comes a slew of classic covers to obsess over by some of the medium’s most illustrious illustrators. But with so many cool covers available each week how on earth do we pick just one for the honour of featuring in our weekly highlight… we don’t, because this week, you do, my celebrated comic contingents. 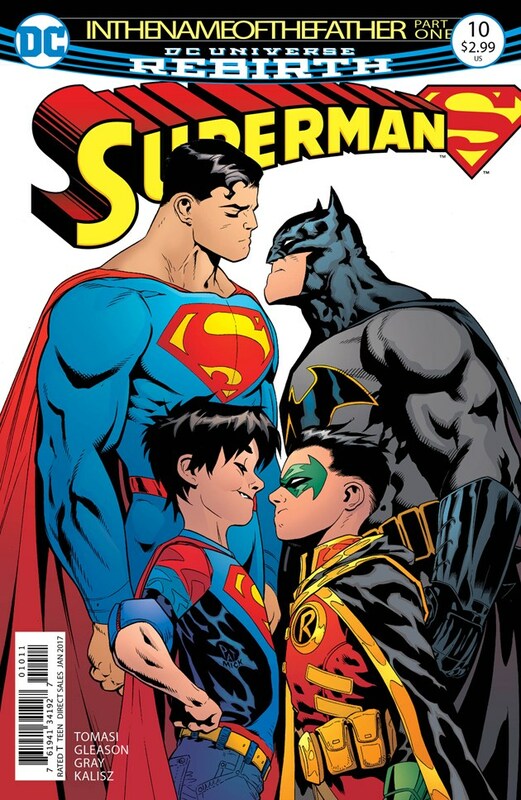 Superman #10 teams together the Caped Crusader and the Boy Wonder, with the Man Of Tomorrow and the Boy Of Steel in an awe inspiring adventure aptly called “In The Name Of The Father.” The cracking cover is finely wrought by Marvellous Mick Gray and perfectionist Pat Gleason. 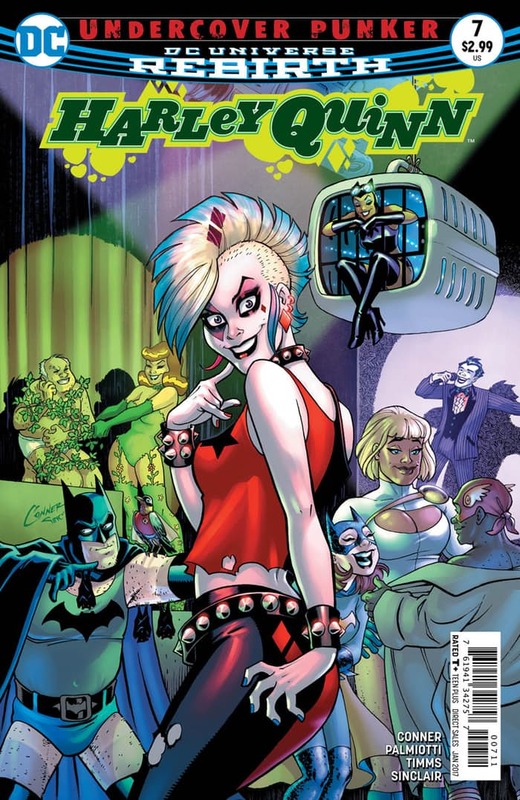 Harley Quinn #7 brings a colossal conclusion to Harl’s punk rock escapades as it finds our irascible heroine, and her bandmates way too deep on their undercover assignment to take down a brutal gang of thieves and murderers, in a tale entitled “Eat To The Beat.” This illuminating issue’s cover is brought to you by the always astounding Amanda Conner. 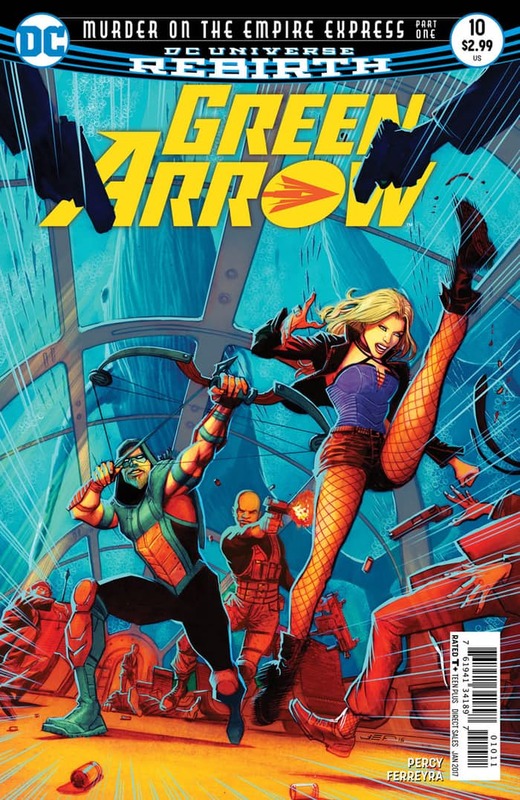 Green Arrow #10 follows Oliver Queen’s new Trans-Pacific Railway, an undersea vehicle that symbolises world peace, on its maiden voyage… but it seems not everyone is enamoured by Ollies olive branch to humanity as the Ninth Circle attempt to stage a high profile assassination onboard the luxury liner. Luckily Green Arrow, Black Canary and John Diggle are onboard as stowaways in a terrific tale titled “Murder On The Empire Express.” The iridescent issue cover is brought to you by jaunty Juan Ferreyra. 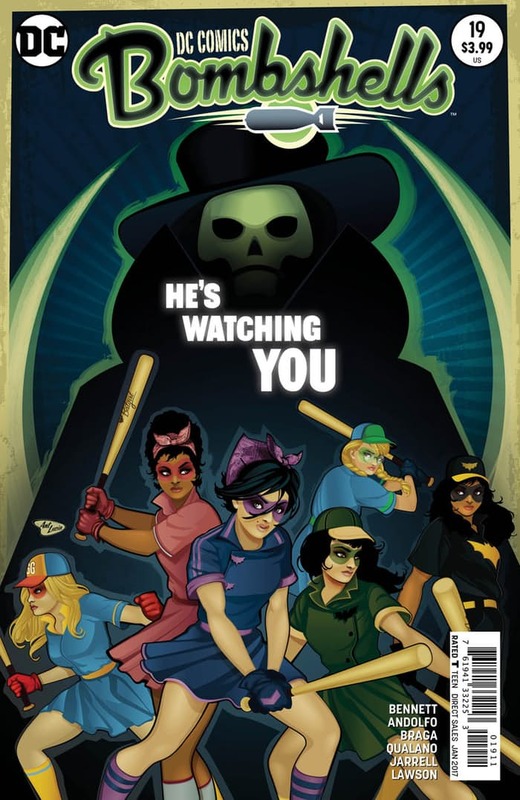 Bombshells #19 brings back our fave team of fighting females ‘The Batgirls’ as they take on the malevolent shadow known as The Reaper, to thwart his attempts to exact vengeance on Harvey Dent, Hugo Strange, Killer Frost and The Penguin. The cosmic cover is brought to you by the astonishing Ant Lucia. Presenting an extra special instalment of Comic Cover Of The Week, as part of our continuing celebration of the Awesome Amazon’s 75th anniversary. A hearken back to my first ever encounter with the Themysciran Titan, way back in that glorious decade known as the 1980’s. Ah the eighties, it was an interesting and rather revolutionary time in the UK. It had just gotten over the phenomenon that was Punk Rock, a rebellious anti-establishment movement that, really, was more about freedom of speech and giving voice to the people than it was about the music itself. I was actually way too young to appreciate the campaign for acceptance and diversity that Punk represented, but looking back on that era now, have come to realise how much Superheroes fit into the same mould as the punk rockers of the day, working outside of Government control, for the benefit of the people themselves. I grew up in the greatest decade in the history of human kind (at least it was to me) the 1980’s. Icons from my era included such luminaries as Siouxsie and the Banshees (my all time favourite band… yes I was a Goth) ridiculously over the top action heroes like Arnold Schwarzenegger, Sylvester Stallone, and Wesley Snipes (my personal favourite), Cynthia Rothrock and Moon Lee (my favourite female action stars.) Video Games began to really take shape, from their previous very simplistic and basic look and premise in the seventies, adding more complexity and depth in both the graphics and gameplay. But even with all these wonderful new distractions available to me, Comic-Books were still my first love, my go to for escapism and ultimate reverie. It was the shadowy Masked Manhunter, The Batman, who initially introduced me into wonderful world of Superheroes. My first encounter with this iconic character was when I was six years of age, I was captivated by his world, so very different from my own (yet at times eerily similar.) Gotham was a terrible, seething place of corruption and murder, yet it had a redeemer, someone who swathed himself in darkness, and was scarier than even the worst denizens of this malevolent city… and yet fought for good! The character beguiled me, and it was through him that my love of not just comics, but also literature itself began. It wasn’t until I was nine that I experienced my first foray into the legendary world of the Amazons, I knew who Wonder Woman was of course, through the occasional crossover story in ‘Batman’ and ‘Detective Comics’ but had yet to branch out fully into other realms, feeling contented in my protracted residence in Gotham City. I have always seen the two characters as my diametrically opposed halves, Batman represents my love of the darkness, gothicism (technically not a word, I know, but I like it) horror movies, the supernatural et al, and Wonder Woman has always constituted my hopes for the future, my work to forward animal rights, vegetarianism, and a general aspiration for betterment of myself and the world about me. And onwards we go, my Amazon loving affiliates, for this might be the end of our week long celebration of 75 years of Wonder Woman, it most certainly isn’t the end of our love affair with the greatest and most important fictional female in history… here’s to another 75 years in her illuminating presence!